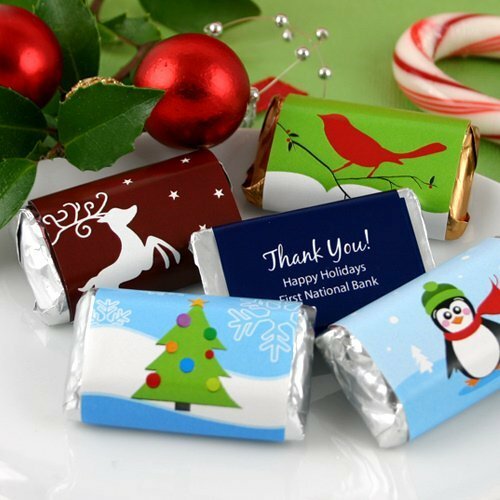 These bite size treats are available in 24 different fun and festive holiday designs. 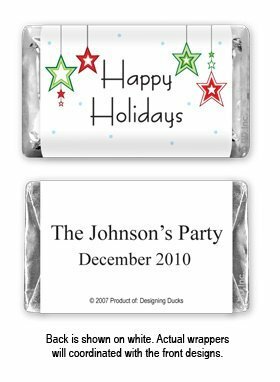 Available with or without assorted chocolate miniatures, we customize the front of each wrapper with the design you choose and the back of the wrapper with up to 3 lines of text. You must purchase at least 100 of any given design. This is one sweet party favor! Hershey Miniature Bars Info: The bars come in the standard Hershey miniature assortment of Milk Chocolate, Krackel, Special Dark, and Mr. Goodbar. Please note that Special Dark Miniatures have gold foil ends and the Mr. Goodbar contains peanuts (in case of allergies). Your bars will arrive wrapped in your personalized labels. Individual bars weigh about .03 lbs and measure 1.75" wide by 1" tall. They have a shelf life of 1 year and are kosher.Note: For sample orders, you will not be able to specify personalization. You can specify the wrapper design however, so please indicate your preference in the order comments field on the shopping cart payment page.